Enjoy the top 1 famous quotes, sayings and quotations by Lynda Hilburn. “He downed the last of his coffee, carried his mug over to the pot, poured himself a refill, and returned to the table. He downed the last of his coffee, carried his mug over to the pot, poured himself a refill, and returned to the table. Why, yes, thank you, I'd love some more coffee. Hmmm, Narcisstic Personality Disorder? Attention Deficit Disorder? Or just a typical male? 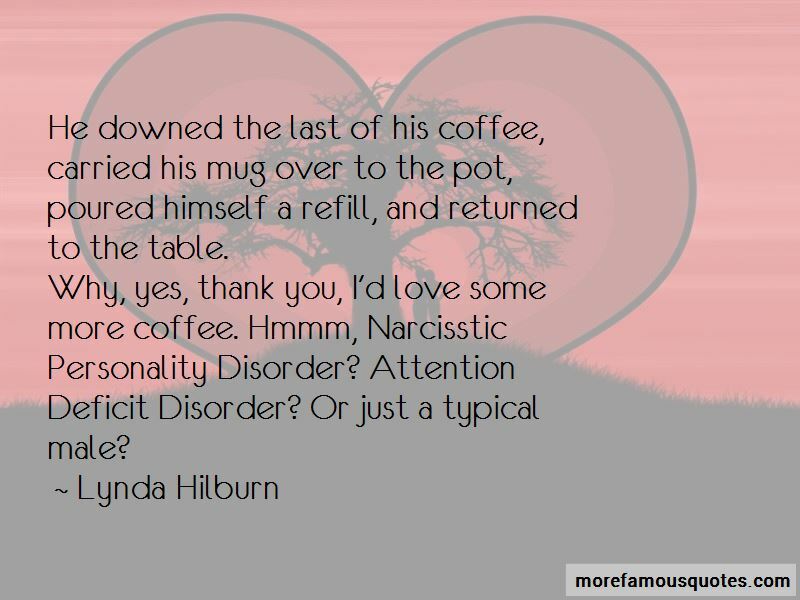 Want to see more pictures of Lynda Hilburn quotes? Click on image of Lynda Hilburn quotes to view full size.